So here comes the seven years of hell that destroyed my home, my marriage and the American Dream for my entire family. I don't say that lightly because I come from a big military family. We have a strong love for our country and what has happened here is quite literally painful to my spirit. I don't live my life in such a way that I spend it in court. I don't get sued, I don't get fines, and I never have had any type of charges against me. None of us do. ​Perhaps that law abiding nature is what made us desirable targets for what happened next. Note the 'balance forward' that they are, in part, suing for. We received title on this property in December 2007. 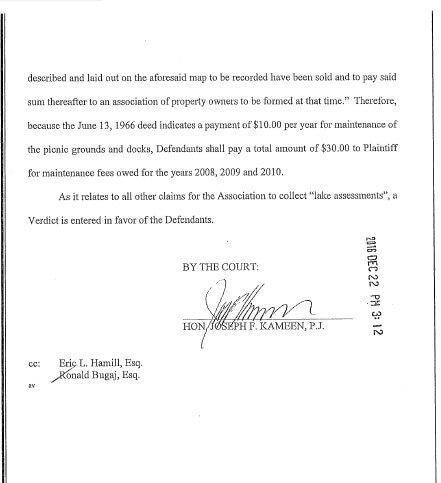 By October of 2010 Walker Lakeshores Landowners Association is saying we owed $5,440.98. That seemed a little off. It is important to note that Maple Park has ZERO deeded rights to ANYTHING in Walker Lake. We have our 1911 easement and we can access it via our Maple Park beach, that is all. Magistrate Cooper correctly judged our case given the information he had. We didn't even realize at that point that we had covenants on the 1966 deed and we didn't know about the 1911 easement. ​His judgement states that we owe $15.00 a year to Walker Lakeshores Landowners Association. Ok so we figure this is a done deal. 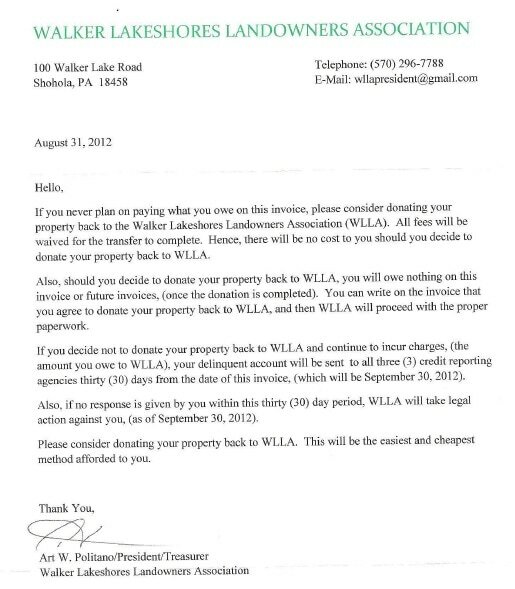 The HOA wants $5,440.98 and on that they got $235.00 total. Obviously, per the court, we are right. Walker Lakeshores Landowners Association appealed. 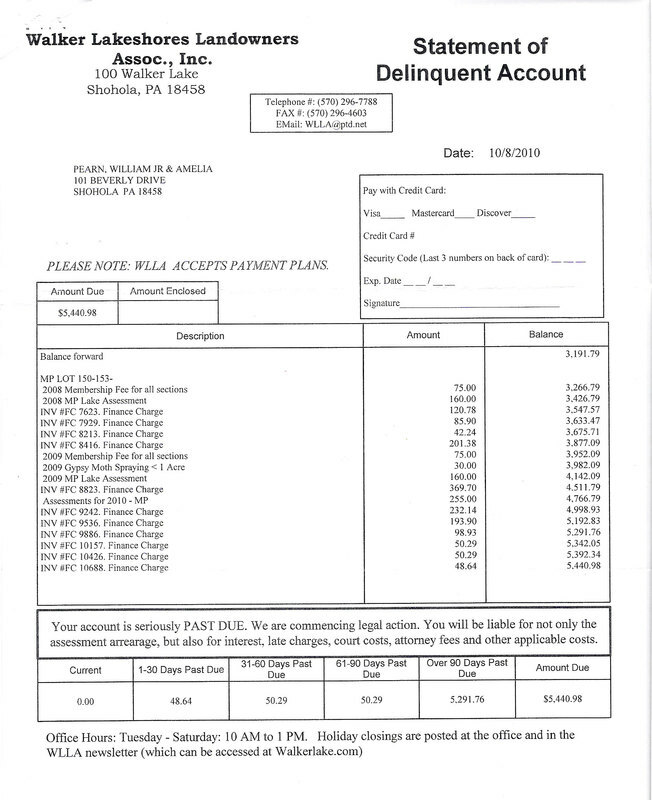 So, by the time we got to arbitration our 'bill' was $8,700. Apparently they can just ignore the lower court ruling and keep adding onto the original 'bill'. I found that arbitration is ......how shall I say this......an insufficient legal remedy. It took several tries to get a full panel, they all seemed to be in a rush, and almost every panel member seemed to act like this was somehow an inconvenience to them. I got news for you panel members, we didn't want to be there either. At least the panel members were getting paid. We had to pay to be there on a bogus bill! 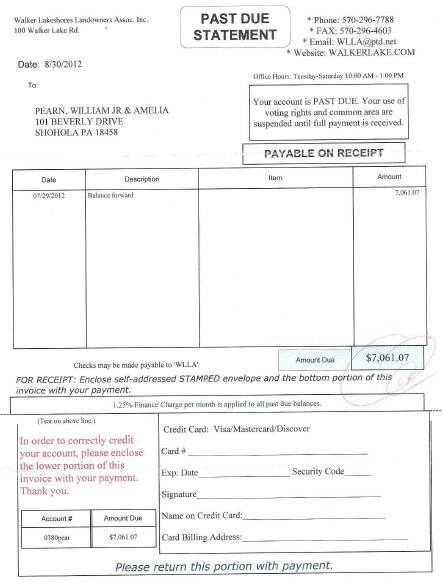 So, on the then $8,700.00 'bill', the panel ended up at an amount of $1,287.96. I have no idea how they arrived at that figure. What you see above is all the information we ever received. That is pretty ridiculous in my opinion. They could have at least made a breakdown of what that amount reflects. Is that an annual amount? Is that for two years back dues? Is it all fees from the beginning of time to date? No one knew. ​So we appealed that decision. You can't go forward blindly when it comes to your property rights. We wanted to settle the matter with a complete legal remedy so that our property rights are actually protected. Unfortunately, because there are no local, state, or federal laws that protect taxpayers against these issues, it all costs money. I have to pay out of pocket. 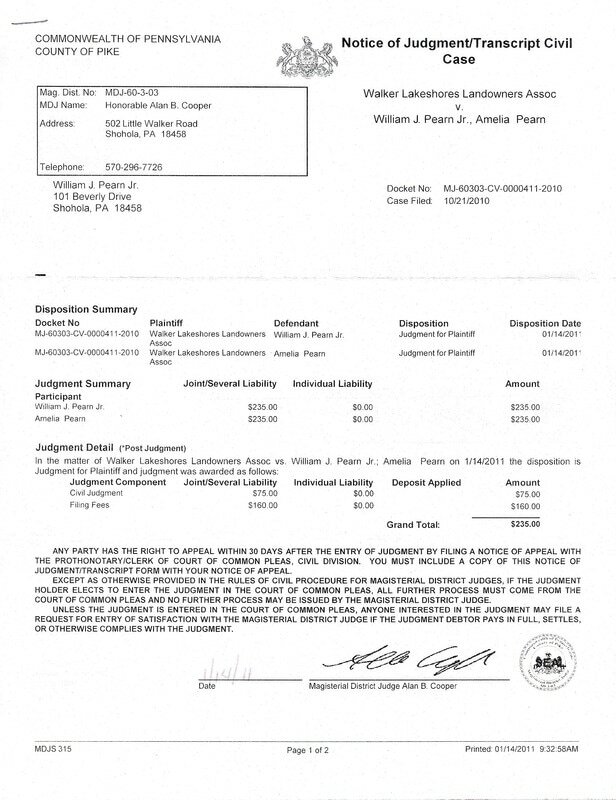 Walker Lakeshores, even though they are legally wrong, just uses their property owners' assessment money. Cute, right? So off we go to the Court of Common Pleas. Now, if you've never been there, there are a few hearings prior to the actual trial. ​While we were going through those hearings, a deal was struck in the case of Hinkel Estates Property Owners Association vs. Walker Lakeshores Landowners Association. 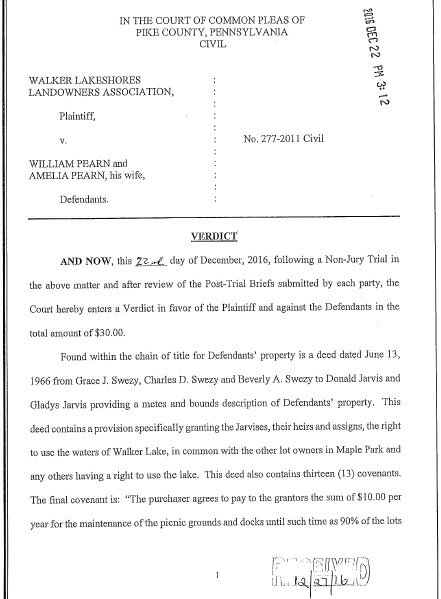 ​I was not part of that, or even aware of it, but Maple Park being named in it and I was mailed a copy of the court ordered agreement. My impression was that there were some disturbing issues going on with respect to property transfers and lake assessment monies collected in Walker Lakeshores. Eventually our case makes it to a non-jury trial in front of the Honorable Judge Kameen. A lot of other things have gone on in the interim, and by this point we now know about the 1911 easement and the 1966 covenant that states a flat rate of $10.00 per year for beach maintenance. 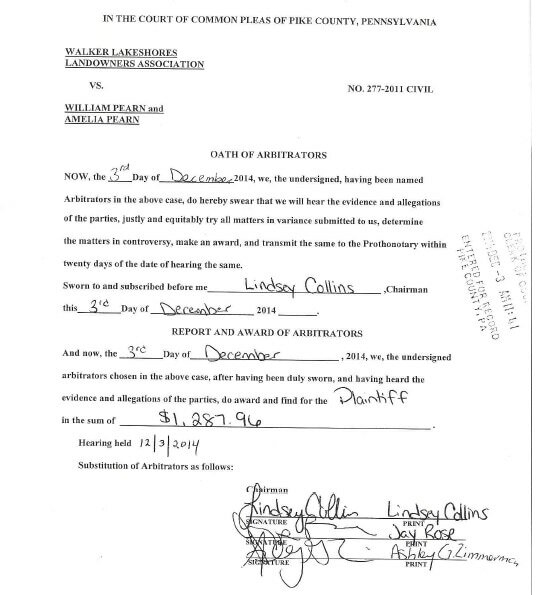 The court recorded testimony from the Walker Lakeshores side was.....well......in my opinion it was fiction. Those records are available at the prothonetary's office. You'd think that that would be the end of it. But you'd be wrong. Walker Lakeshores attempted to have this decision thrown out, however, that didn't happen. 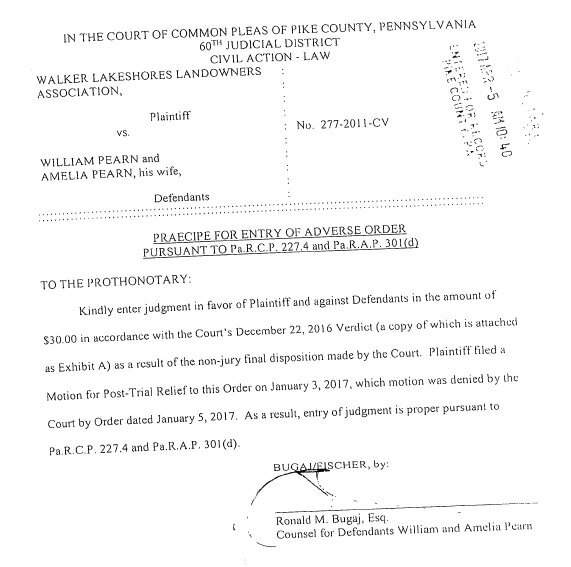 Just as Justice Cooper had, Judge Kameen had wisely judged in this case and the argument presented by Walker Lakeshores, in their post trial motion, was in my opinion nothing short of idiotic. 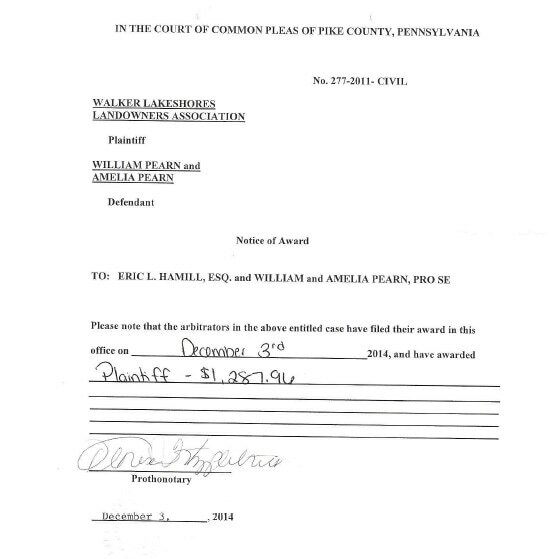 In March of 2017, we decided that we want the Court of Common Pleas' judgement entered so that we can sell our home. You can't sell a home with a lawsuit hanging over it, because, no one in their right mind will pay a fair market value for that. 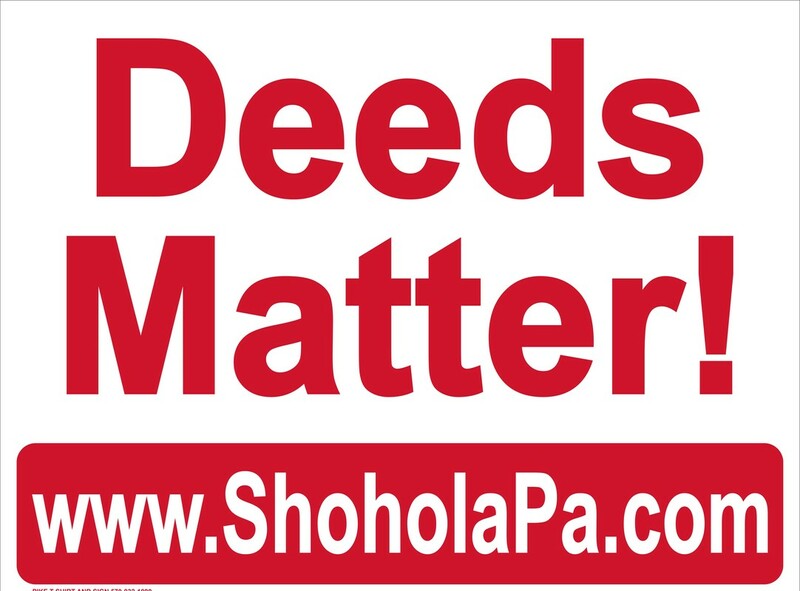 ​In April of 2017 we asked the court to enter our judgement so we can put our home up for sale to remove ourselves from this HOA horror story. 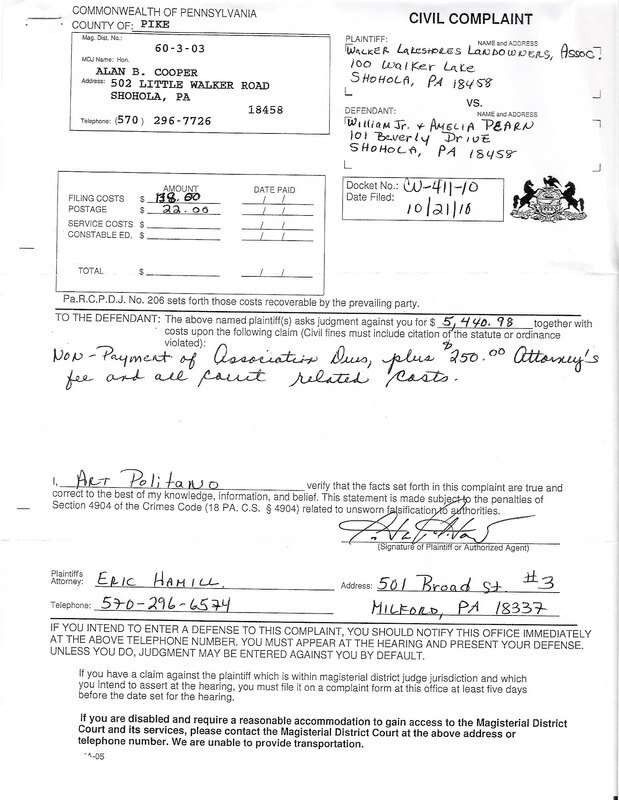 They are looking to spend THOUSANDS of dollars from their membership funds to try to appeal the $30.00 judgement. So.......why? Why would they want to spend money like that on a losing case? 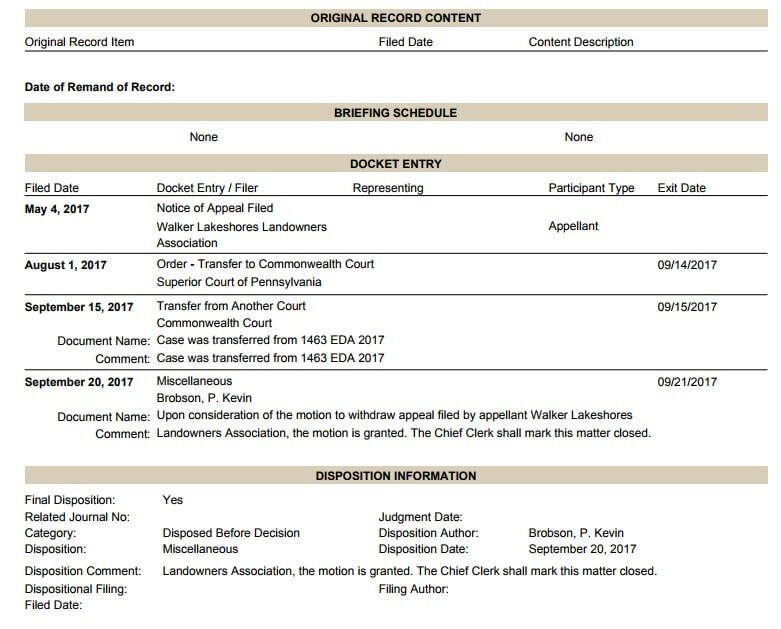 ​I have never even seen a docket where they have taken their own HOA property owners to the Court of Common Pleas, let alone taken one to Superior Court. It defies logic right? Why would they want to go to Superior Court? In my opinion, they want my case to go there in hopes that they will win so it will become case law. 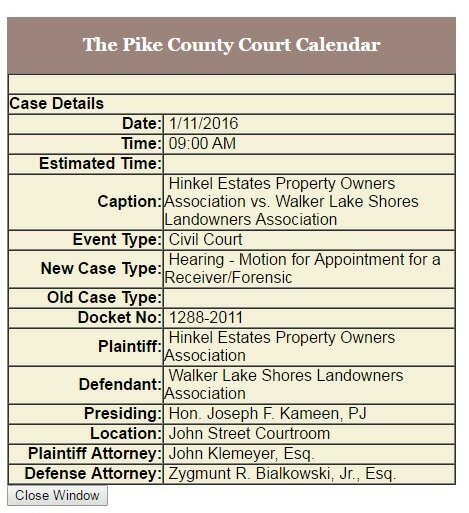 My case being case law would mean that they can then use it (and any HOA in Pike, Monroe, and Wayne Counties can use it) to sue anyone anywhere regardless of what the owner's deed says. ​That situation could potentially open up a lot of litigation, and a lot of free money, for HOAs and their attorneys at the expense of taxpaying land owners. 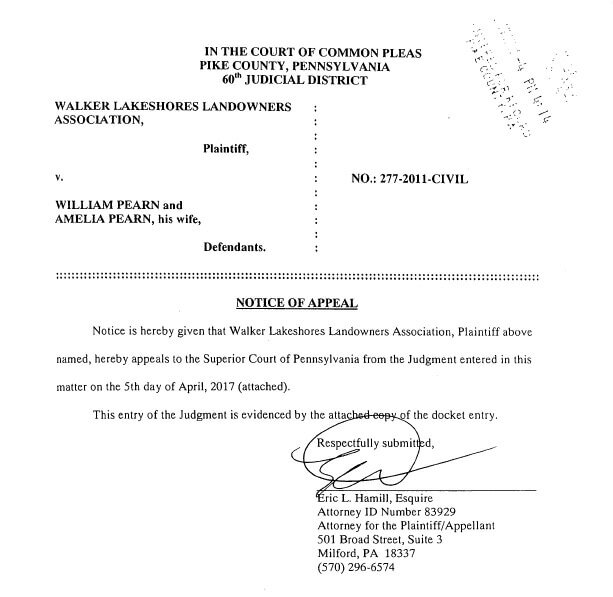 September 2017 Walker Lakeshores pulled their appeal. Visit the Updates page to see what is happening now.